The Sleigh design glider provides comfortable seating in the nursery, living room, or office. It is ideal for nursing a baby, watching TV, or simply relaxing after a long day of work. The sturdy hardwood construction and generous padding on the seat, back, arms, and ottoman will ensure your enjoyment. 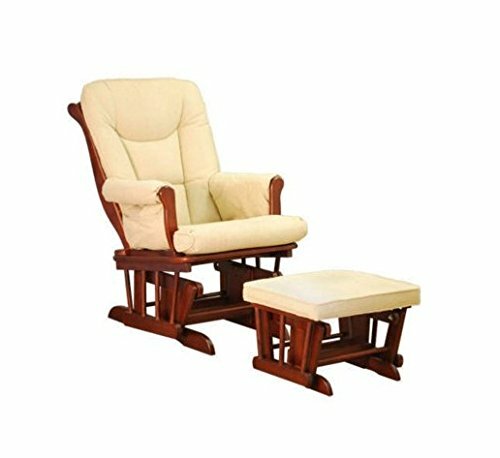 Top quality steel ball bearing glides on both the chair and ottoman make the gliding action smooth and quiet. It's all about luxury and comfort and makes a wonderful gift for new parents-to-be. 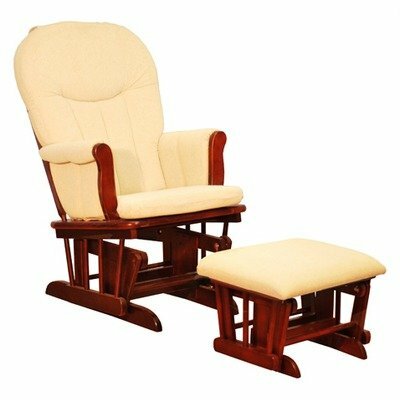 Glider Chair, Color CherryThe Deluxe Glider Chair is ideal for almost any room in the house. Its sturdy birch hardwood structure offers the safety and comfort with an easy glide function. This chair combines the traditional rocking chair with modern style. Glider chairs come with a removable matching ottoman. Color Cherry. Features:Birch wood construction and non-toxic easy care finish Matching ottoman provides additional leg support Smooth gliding motion gives you the comfort of a traditional rocking chair Thickly padded arm and seat cushions provide long lasting comfort and support Larger and more comfortable than traditional glider chairs Product Dimensions:30“ L x 23“ W x 42“ HPackaging Size:36“ L x 26“ W x 23“ HProduct Weight:49 lbs Product photo may not exactly match the product offered for sale. Please refer to the product description. - Charming, comfortable, affordable - Soft, smooth, well-cushioned seat - Thickly padded arms ensure everlasting comfort and support - Magazine Pockets on both sides - Smooth ball bearing gliding system - Removable back and seat cushion - Matching ottoman provides additional leg support - Non-toxic finish, Sturdy solid wood construction - Assembly Required - Glider Dimension: 27" L x 24" W x 40" H - Ottoman Dimension: 20" L x 16" W x 14" H The Sleigh design glider provides comfortable seating in the nursery, living room or office. It is ideal and comfy for nursing a baby, watching TV or simply relaxation and kicking back after a long day of work. The sturdy hardwood construction and generous padding on the seat, back, arms, and ottoman will ensure your enjoyment. Top quality steel ball bearing glides on both the chair and ottoman make the gliding action smooth and quiet. It's all about luxury and comfort and it makes a wonderful gift for new parents-to-be. The Deluxe Glider Chair is ideal for almost any room in the house. Glider chairs come with a removable matching ottoman. Its sturdy Birch hardwood structure offers the safety and comfort with an easy glide function. This chair combines the traditional rocking chair with modern style. Glider Chair, Color NaturalThe Deluxe Glider Chair is ideal for almost any room in the house. Its sturdy birch hardwood structure offers the safety and comfort with an easy glide function. This chair combines the traditional rocking chair with modern style. Glider chairs come with a removable matching ottoman. Color Natural. Features:Birch wood construction and non-toxic easy care finish Matching ottoman provides additional leg support Smooth gliding motion gives you the comfort of a traditional rocking chair Thickly padded arm and seat cushions provide long lasting comfort and support Larger and more comfortable than traditional glider chairs Product Dimensions:30“ L x 23“ W x 42“ HPackaging Size:36“ L x 26“ W x 23“ HProduct Weight:49 lbs Product photo may not exactly match the product offered for sale. Please refer to the product description. 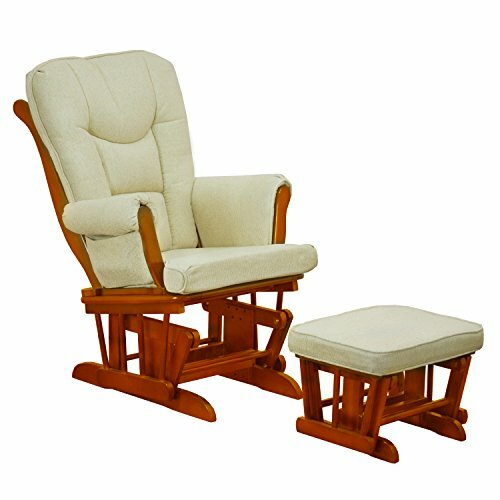 - Only 4 screws to set up - Made by high quality of non-toxic Birchwood - Generous section room with thicker padded arms - More comfortable and lager than other glider chairs - Matching ottoman gives good additional leg support - Sturdy construction - Gliding motion gives you the comfort of a traditional rocking chair - Comes with matching ottoman and padded arm - Removable back and seat cushion - Glider Dimension: 30"L x 23"W x 42"H - Ottoman Dimension: 16.5"L x 16.5"W x 13.5"H The GL7026 Glider Chair is ideal for almost any room in the house. Its sturdy Birch hardwood structure offers the safety and comfort with an easy glide function. This chair combines the traditional rocking chair with modern style. Glider chairs come with a removable matching ottoman. The handsome craftsmanship and solid hardwood construction of the grace 3 drawer changer provides three drawers that are deep enough to hold blankets and other needs which glide smoothly over metal runners. Sleigh style cues across the changer allow it to easily pair with other pieces in the Athena collection. 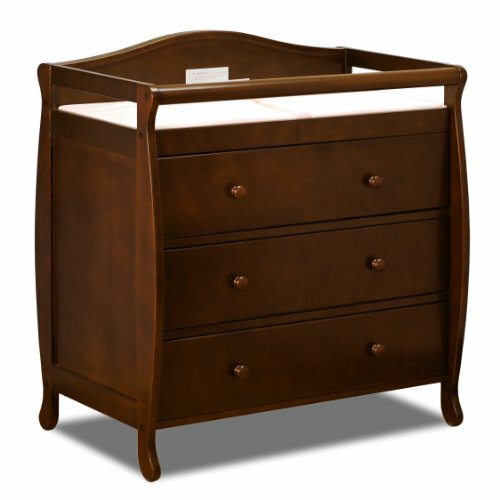 A dual function changer provides ease of use, a mini chest and a changing table top. Changing pad sold separately. 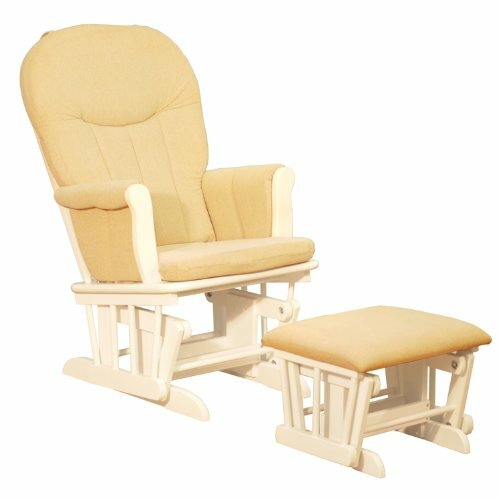 White Deluxe Gilder Chair with Beige Pad. Compare prices on Afg Glider at ShopPlanetUp.com – use promo codes and coupons for best offers and deals. We work hard to get you amazing deals and collect all available offers online and represent it in one place for the customers. Now our visitors can leverage benefits of big brands and heavy discounts available for that day and for famous brands.